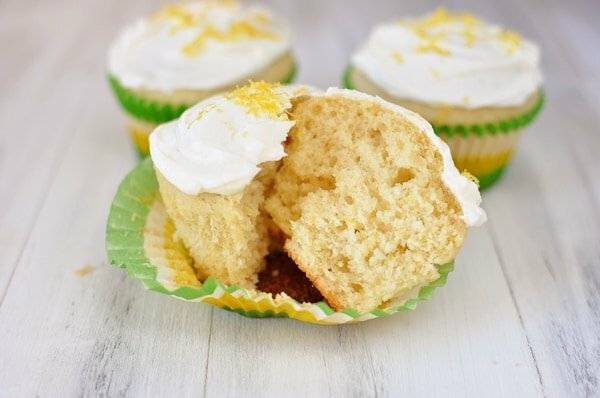 Light, lemony and totally luscious, these lemon cupcakes really are perfect. 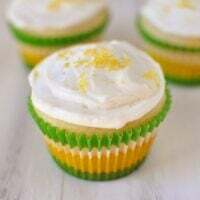 They have a delightfully tender crumb and while the cupcakes themselves aren’t overpowering in their lemon flavor, the light hint of zest in the batter is complimented by the outrageously tangy and sweet lemon frosting. With just a light sprinkle of fresh lemon zest on top of the cupcake, you have a terribly wonderful lemon cupcake. And there really is nothing wrong with a cupcake being terribly wonderful, trust me. These cute little cupcakes domed so perfectly that I opted for a simple swath of frosting across the top instead of a fancier presentation. The light jumble of zest on top of the cupcake is decoration enough, I think. In hindsight, I should have called these a “Farewell to Green Bay” cupcake (we just moved to Minnesota from there) since my cupcake liners are unintentionally screaming Green Bay Packers (sorry if you have no idea what I’m talking about – you obviously don’t live within a 300-mile radius of Green Bay). Packer colors or not, the cupcake inside the liner is worth the making. Promise! Preheat the oven to 350 degree F. Line about 15 muffin cups with paper liners and set aside. In a large bowl, beat the butter with an electric mixer on medium speed for 30 seconds. Add the granulated sugar and vanilla; beat until well mixed. Add the egg and egg yolk and mix well. Add the 1/3 of the flour mixture and mix. Add 1/2 of the sour cream and mix again. Add another 1/3 of the flour mixture, stirring until combined. Add the final 1/2 cup of the sour cream and after mixing, add the final 1/3 of the flour. Mix just until combined. Stir in the 2 teaspoons lemon zest. The batter will have a thick consistency. Spoon about 1/4 cup of the batter into each prepared muffin cup filling between 1/2 and 2/3 full. Bake the cupcakes for 16-18 minutes until a toothpick inserted in the center comes out clean. Cool completely on a wire rack before frosting. For the frosting, in a medium bowl, beat the butter, powdered sugar and lemon juice together until light and fluffy, about 1-2 minutes with an electric mixer (stand mixer or handheld). Mix in the vanilla and add 1-2 teaspoons of milk to adjust the consistency, if necessary. It should be creamy and spreadable. Stir in the 1 teaspoon lemon zest. Dollop a tablespoon or two of the frosting on each cupcake and spread until smooth. Top with a few sprinkles of fresh lemon zest, if desired. My 13 year old just made these for me to celebrate my 40th birthday this past Sunday……oh my goodness these are amazing!! My whole family loves anything lemon. Easily the best cupcake I’ve ever had!! We’ll be making these again and again. Hi Mel! I am wanting to make these for an upcoming event, but I need to make them ahead of time. Do you think these would freeze well? Or would the lemon frosting/flavor taste funny after being frozen? I wouldn’t freeze them already frosted – although you could probably freeze the cupcakes and then frost them after they defrost? Just made a double batch for my Birthday Buddy at work, but couldn’t resist a sample with my evening cuppa- just delicious. Question: I made these last year for my daughter’s birthday (topped them with Swiss Meringue Buttercream, OMG), and they were excellent! Could this recipe be used to make a cake also (two 9-inch rounds)? Or would it need some tweaking? Thanks! Emily – Worth a try but sometimes cupcake recipes don’t translate well to cake versions. I’ve never tried it so I don’t know for sure. Can you please tell me how many grams or ozs to a your cup of flour? I never seems to get the same amount every time I try. Your cupcakes looks so nice. Want to try them but seems to get different weight with every cup I weight. Helen Khoo – I haven’t weighed the ingredients for this recipe. Usually it’s about 4.5 to 5 ounces of flour per cup. Good luck. Sorry I am not more help. Hi Mel…I am wondering if this particular frosting could be put in a bag and swirled on top of the cupcake as opposed to just spreading it? I’m planning on making a batch for a baby shower and I think they will look fancier with a swirl. Do you think it will hold up in a piping bag? BTW Your website is my go to place when I need an amazing recipe!!!! Erin – It’s been a while since I made these cupcakes but if I remember right, the frosting is a little too soft for piping. You might try another frosting recipe that is sturdier and experiment with lemon flavor. Good luck! Definetly belong in “The Best ” file, these are sooooo good. Changed nothing and they were a hit…thanks! Hey! This cupcakes taste really good! But I had wondering why the cake won’t raised it looks good when they are still in the oven, but they’re going down immediately when they outside.. Do you have any idea why it happen? Pinota – try adding an extra minute or two to the baking time. DT – I follow the recipe, which states to beat until well mixed. That should work! Do you have to cream the butter and sugar until light and fluffy or stop once they are well mixed? Holy smokes, Mel! These are perfectly lemony, and no boxed mix! The icing is simply divine. Thank you from the bottom of my lemon-loving heart. I made these today for my daughter’s birthday party. They were delish! 😀 Anything with lemon, thank you! I made these this morning and they were easy and delicious! A great addition to any playgroup or get together. I’m not the best baker and they turned out perfect so they must be pretty fool proof! The frosting is finger licking good as well. Thanks for the idea. I’m sure these will be made in my house a lot! These look really good and easy enough to do, too. I love the cupcake liners, I thought that they were perfect for the lemon cupcake and zest on top. I can’t wait to try this recipe, I love lemon. I am a lemon lover and these look yummy, the texture in the close-up pic really impressed me. Nothing says love like a home baked goodie so I am dismayed with everyone on the issue of school treats. As a teacher I used to love to bring in the occasional cookie or cupcake (or, candy for Halloween and Valentine’s) but now in our area no items deeed “unhealthy” are allowed. This also eliminates the bake sale or candy bar fundraisers that a lot of the school clubs counted on to bring in needed monies. It also eliminates a lot of the FUN we used to have! what a glorious texture! i love using sour cream as the liquid in cakes–it’s unbeatable! Fabulous recipe! I am terrible at making cupcakes. They usually end up sinking in the middle (I’ve tried the vanilla buttermilk cupcakes a million times and they always sink), but these turned out perfect! Perfect I tell you! Oh, and they taste fabulous too 🙂 Thank you! Just made your perfect lemon cake for family party yesterday (was SO perfect!) but had JUST checked to see if you had something similar without a cake mix.. and the next day- voila! Here it is! hurrah! I’ve got to say – that the cases really make them – they are just perfect with the yellow and green – and the pure white frosting with just a sprinkle of yellow make them look gorgeous! Marcelle – I’ve never made this recipe into cake form so I can’t tell you if it will work or not. Sorry! Very well done, interesting not sure I agree but happy I found this site. I have just arrived in the England. My name, Anuta is identical in English and Russian. I am a bit bored so I am surfing the net; making cupcakes and doing Zumba classes to make new acquaintances in London. Love lemon anything. The wrappers are nice too but lemon cupcakes? Yum! 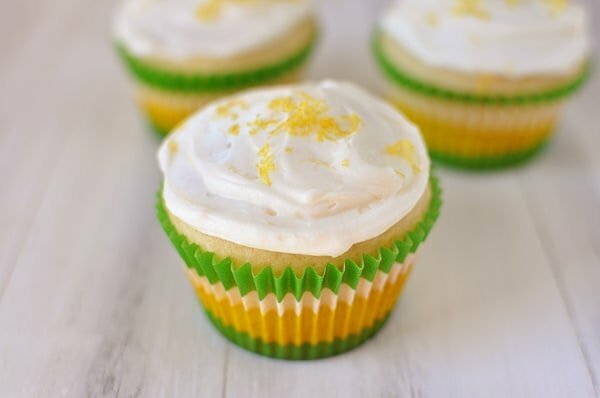 Love the liners and love these cupcakes….I am a fan of desserts with lemon flavor! Yay! I’m so glad you liked them! Don’t they have such a wonderful texture? They are very deceiving in that when you feel them they seem like they are going to be dense or heavy, but instead, they’re tender and moist. Anyway, thanks for reminding me I have a ton of lemon to use! Oh my gosh, Vicky – I thought I was the only one! Our new school has a hard fast policy about NO homemade treats at school. I know for some schools it’s because of allergies (I get that) but our school’s policy is formed because you can only bring in treats purchased from the school’s food services so I think it’s an effort to keep the money in the school. My kids were so sad (yes, they need to get a life) when they realized they couldn’t bring in fun cupcakes or homemade cookies for their birthdays. Looks like we’re stuck with a fruit rollup or Gogurt from Food services. Ick! So I can commiserate with you! Those sound so yummy! So, can I just complain to you for a sec about the fact that my son’s school doesn’t allow homemade treats? So to celebrate his birthday in class today, I have to go out and buy two dozen commercially-prepared cupcakes. Bleh. Thanks for the info about the liners. This website might be addictive! Bex – I know real foodies and bakers out there frown on salted butter. I have to admit, it’s all I use. So in any of my recipes, unless it specifically states unsalted butter in the recipe, I’ve used salted butter. If you are used to using unsalted butter just adjust the salt amounts accordingly. We live in Green Bay and are very into the Packers and football in general. Your recipe looks great and I’ll be trying it. I’m wondering if you can tell me where you got the cupcake liners. They would be a huge hit here and I have several friends that would love them. Don’t forget who you need to cheer for tonight when the Packers play Seattle!!! Thanks. Generally, when you put “butter” in your recipes, are you ALWAYS using UNSALTED butter? That is the only kind we buy here so if you are, then your recipes won’t need extra salt, but if you are using SALTED butter, maybe a little salt adjustment should take place. Just wondering….. I also love lemon anything so will try these for sure! Thank you! I love lemon anything and can’t wait to try these out. I thought the liners where very springy in color, and perfect for a lemon cupcake. Can you tell I’m not into football? Three words…Go Pack Go! Oh, and these look yummy, lemon is my favorite! You are a mind reader I tell you!!!!!!! I have been craving something with lemon for days,how did you know?LOL. I will be making a double batch of these TODAY since I feed several elderly neighbors. Thanks SOOOOOOO much.